You may have chosen a particular month for your wedding for a special reason, there may be a date that means something to you as a couple such as the date you met or the first time you had dinner together. Perhaps you have chosen your date due to the time of year and the weather or that you like the way that the sunset colours the sky in the summer. For whatever reason you have chosen your particular month to get married, here our colour choices and favourite reasons, with flowers and tips to represent each month, in a wedding kind of way ..
At the start of the new year, think of this month as a blank canvas for days to come and for the rest of your lives when planning your wedding. With the scorching hot weather across most of Australia you will be spoilt for choice in terms of location and possible wedding venues. January - Summertime in the sothern hemisphere: Creams and white make a lovely cool combination. The first thing that springs to mind at this time of year is the bright white sand and brightness of the sun to influence our colour choice. We have chosen Cream & White to represent January for your wedding flowers you can expect to find carnations and snowdrops available and they are generally the most popular choice for January. 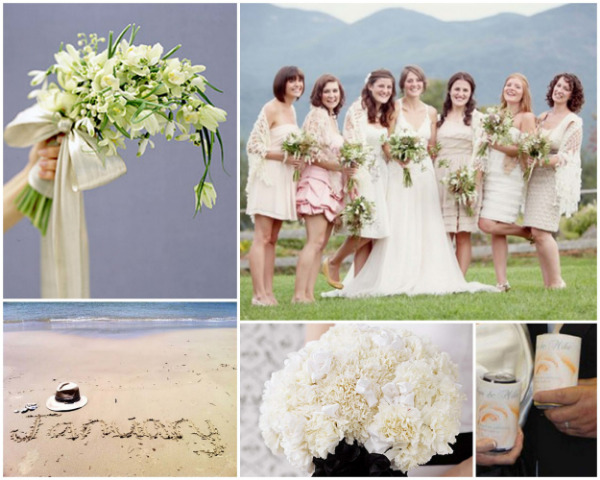 Dress your bridesmaids in matching creams and keep things simple and clean for the whole event. For this month we have chosen Purple, you will find violets readily available at this time of year for your wedding bouquets and this is also the traditional flower of the month along with the primrose. February's vibrant purple colour options - works wonderfully in combination with ivory and cream - and also shades of silver too! February in Australia is often one of the hottest months and purple is a fantastic colour to compliment any wedding party, you can team this colour with creams and whites for a light and bright celebration or choose a darker purple with shades of eggplant and plum for a more sensual and romantic setting for your reception. The first of March marks the beginning of Autumn in the southern hemisphere, this season brings us jonquils and daffodils which make a fantastic pair and add some bright colour to your wedding day, your accessories and bouquet. Add a lemon yellow interior foam to your wedding stubby holders to complete the look! To match the choice in flowers available this month we have chosen Yellow to represent March. You can match this with white and/or some leafy greens for a fresh look at your wedding celebration, a colour combination that would be ideal for an outdoor/garden wedding or any relaxed indoor setting. As the weather starts to get a little colder through mid-autumn we have chosen Fuchsia Pink to brighten up your wedding theme. You can have just a hint or go bold and splatter this beautiful colour all over your wedding. Fuchsia pink is beautiful, vibrant colour that works so well with hot climate weddings. Create a tropical array of colours for your flower bouquet with some simple multi-coloured sweet peas, and why not replicate these on your wedding cake too. As winter slowly creeps in, think back to all of those autumnal colours that you love! There are some amazing ways to incorporate some hues of Orange into your wedding day. You can go bright a vibrant or soft a subtle, don't forget that you can mix this into your wedding attire, decorations and even your food or wedding buffet. The birth stone for May is emerald, this colour can look great with the right tint of orange, you can also get some beautiful lilies to match these are in their abundance at this time of year and the apricot shades look great in a wedding bouquet with any type of yellow or green flowers for a warm ambiance. For a winter wedding in June we have chosen Teal, this can be incorporated into your wedding bouquet, table decorations, buttonhole and more. With roses in bloom you can add a touch of teal using ribbons and even buttons like the image below, a great way to add a modern twist. If you are looking for a theme to match this vibrant colour you could go for a vintage peacock style or add some natural browns for an organic feel. With the birthstone of this month being ruby we have chosen Red to represent your wedding in July. As a bright contrast against the white of your wedding dress or iced cake a ruby red element would make a fantastic theme! Wow! Red, when it works it just jumps at you! Why not add a cheeky peep toe of a red show under your dress or paint your nails to match your ruby red wedding accessories. We have selected a organic green tone to match the stone for August, the Peridot is an intense olive green coloured gem stone that will be sure to add some much needed sparkle to your 2013 wintery wedding in the southern hemisphere. Choose an exotic blend of spring green and white flowers for your wedding bouquet, these might include Paphiopedilums also known as Ladies Slipper Orchids along with some Lenten Rose, and Freesias. Olive greens can also look great paired up with dusty pinks and dark purples- a wonderful combination for a modern outdoor wedding or to brighten up an indoor reception. Sapphires can be found in a range of blue shades and this sparkling gem is traditionally the birthstone of Septmeber, so if you are looking for a colour to suit your wedding in this month then why not choose Sapphire Blue. Maybe you can supply some Bombay Sapphire gin cocktails on arrival, or decorate your tables with personalised wedding stubby holders if you are having bottles on the day! Make sure that you go for a blue petal flower such as morning glory, most skin tines will suit a bright blue so you can rest assured that your bridesmaids and groomsmen will look stunning in this vibrant and modern colour choice. The birth stone for October is Rose - this can be reflected in both flower type and general colour. The name Rose lends itself to feminine influences and soft tones, for that reason we have chosen Coral Pink to represent this month in our colour chart. Vintage palettes are currently very en vogue - mint, coral, cream and baby blues all work exceedingly well together. Perfect for a classic or vintage style wedding, the use of Chrysanthemums and daisies in your posie can look fantastic. You could also add a modern twist by teaming your pinks with a Mint Green. For November we have chosen Copper this rich and luxurious colour would suit any bride and groom and formal wedding setting. You can even go as far as having the bride's bouquet made our of intertwined copper wire for a really unique style. When copper corrodes it tends to go a really beautiful bright green/teal colour, you could incorporate this into your theme using some of the ideas from our June section, perhaps if you fancy a bohemian wedding theme or vintage peacock style then this will sit nicely in the colour scheme. To finish off the year we have chosen a classic combination of Black & White. Thinking of black feathers, dark chandeliers, vintage stripes and classic scroll patterns. From your save the dates, wedding invitations through to your bombonierre gift ideas you can team any black design against a white background to create a truly sophisticated wedding style. Black and white is very easy to design classic wedding stubby holder with - most of our designs have a black and white option that will look fabulous. Consider your wedding flowers, choose any white or cream varieties paired with blue-black privet berries or black jewels, you could also use white gerberas with black centres to continue the theme for your stylish black and white wedding. If you dare to be different you could also go for a black wedding gown and dress all of your bridesmaids in white, a reverse effect that will surprise all of your guests! Check out these online forums and wedding blogs for some great stories about having Coolaz coolers at your wedding, no matter what colour you choose for your theme we have hundreds of combinations, styles and designs. With our outstanding print quality you can be assured that your custom wedding stubby holders will be a perfect match; Happy planning!